Just a month before our voyage, “they were thick out here,” said Elizabeth Daly, a marine biologist at Oregon State University's Hatfield Marine Science Center. "This means the cells that are created prior to becoming sperm or egg are sometimes more susceptible to EDCs," said the study's lead author, Bethany DeCourten, a doctoral student at Oregon State University. A professor and expert on Islam will speak next Thursday at Oregon State University on ""The Spread of Islam: New Ways of Understanding Conquest and Confessional Change in Iraq, Iran and Central Asia." 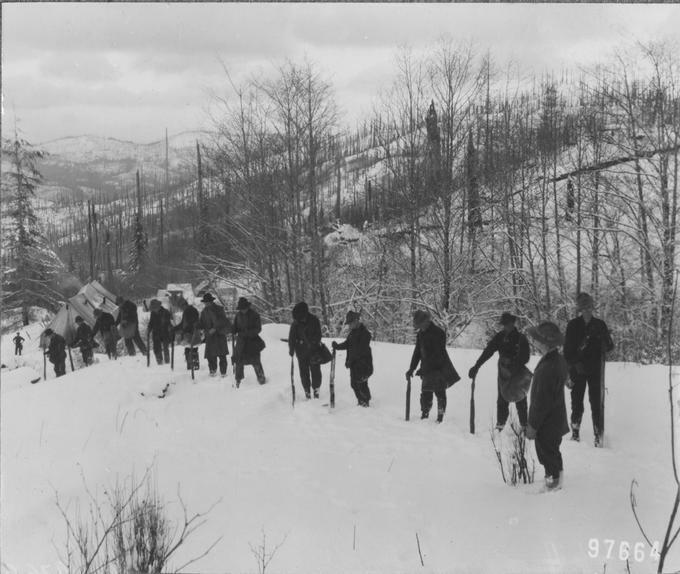 Dibbling walnuts in the snow: This fine team of folks braved the snow on Mount Hebo in 1910 to 'dibble' or poke a hole in the soil to plant walnuts. There is the possibility of snow showers in the Willamette Valley on Monday and Tuesday but so far no word if any actual accumulation will take place. Cheese sales: Time to restock your fridge and your bellies with Beaver Classic Cheese. Friday Sales begin today, 11 a.m.-1 p.m. at the creamery. Come try our five cheddars, two Swiss and two provolones, plus cheese curds. The creamery is located in 159 Withycombe Hall. NEW! Taco sale: CCVM will have a taco sale on Friday, Feb. 1, 11:30 a.m. through 1 p.m. in Magruder Hall. For a $5 donation, you will get two tacos or a taco bowl plus a drink and a cookie. For questions, contact sara.k.smith@oregonstate.edu. NEW! Music a la Carte: Violinist Sarah Kwak and pianist Cary Lewis perform “The Lark Ascending” by Ralph Vaughn Williams and Sonata No. 1 in D minor by Camille Saint-Saens. Noon, Friday, Feb. 1. MU Lounge, free. Meat Center: The Clark Meat Science Center retail store will be open Friday from noon to 5:30 p.m. Products include fresh and cooked/smoked sausages, bacon, retail cuts, jerky, snack sticks, and Beaver Classic cheese. The store is located at 3260 SW Campus Way, next to the Motor Pool. Contact Nathan.Parker@oregonstate.edu for questions regarding the store. Landscape Magic: Waiting for Spring: “Landscape Magic: Waiting for Spring,” an exhibit of artwork focused on the beauty of winter and the promise of spring, will be on display Feb. 1 through March 5 in the Giustina Gallery at the LaSells Stewart Center. Fourteen Pacific Northwest artists working in a range of styles and mediums will be featured in the invitation-only exhibit. Opening reception is Feb. 1 from 6 to 8 p.m. and is free and open to the public. The Giustina Galleryhours are 8 a.m. to 5 p.m. Monday through Friday. The gallery is also open some evenings and weekends, depending on scheduled events. Women’s Basketball: OSU vs. Utah, Feb. 3, noon, Gill Coliseum. NEW! Decades Dance: Missing the good old days? Come to the Decades Dance! Best of the '60s,'70s, '80s, '90s and beyond. Dress up in your favorite outfit from your favorite decade for this Faculty Staff Fitness fundraiser that takes you back to the hits of each decade. The event will be March 2, 7-10 p.m., in the Women's Building Gym. There will be a cash bar. Early registration online $15, at the door $20. Invite your friend, meet new people and support Faculty Staff Fitness. For more information and to register visit: https://health.oregonstate.edu/faculty-staff-fitness/events/decades-dance. The 4th annual Human Library: Event participants will engage in 45 minute two-way conversations with individuals who volunteer as “Human Books.” Experiencing a discussion with a human book creates an opportunity for constructive dialogue, learning and empathy between two people who otherwise might not interact. A list of books and registration for “readers” are available at https://guides.library.oregonstate.edu/humanlibrary. The event will be held on Wednesday, Feb. 13, 10 a.m. to 3 p.m. in the Valley Library, 4th Floor Rotunda. Preregistration is strongly encouraged. Please direct accommodation requests related to disability or general questions to Shalece Rains at 541-737-4537 or shalece.rains@oregonstate.edu. This event is sponsored by OSU Libraries and Press and the University Ombuds Office. NEW! Department of Integrative Biology Ph.D. Defense Seminar: Ian Morelan will present "16S rRNA Gene Amplicon Sequencing Reveals Marine Bacterial Diversity in Natural and Human-Built Systems" on Monday, Feb. 4, at 12:30 p.m. in LPSC 402. Morelan is completing his Ph.D. in molecular and cellular biology under the guidance of Dee Denver. Free and open to the public. NEW! 2019 Harward Lecture: Randy Dahlgren, Professor of Soil Science at the University of California, Davis, will give the 2019 Harward Lecture on “Biogeochemistry in California Oak Woodland-Annual Grassland Rangeland.” He will speak Feb. 4 at 4 p.m. in the Agricultural and Life Sciences Building, room 4000, as part of the Crop and Soil Science/Horticulture Winter Seminar Series. For more information, contact Emmalie Goodwin at Emmalie.Goodwin@oregonstate.edu. NEW! ElderCare Connections: Corvallis Senior Center: Join us on Tuesday, Feb. 5, from noon to1 p.m. in MU 207 to learn about classes and offerings provided by Chintimini Senior & Community Center. To see upcoming topics, please visit https://familyresources.oregonstate.edu/eldercare-connections or contact familyresources@oregonstate.edu. NEW! Updates to University Policies & Standards: Please visit the University Policy & Standards page (http://policy.oregonstate.edu/whats-new) to learn about recent and pending policy amendments, which includes University Policy 01-020 International Travel. The What’s New page is updated frequently with new developments so we encourage you to check back regularly. NEW! Leadership conference: Student Leadership & Involvement presents the OSU Leadership Conference: Exploring Courageous Leadership on Feb. 16 from 10 a.m. to 3:30 p.m. This event is free, open to all OSU students and held in the Memorial Union. Registration is required by Feb. 8 at https://sli.oregonstate.edu/ld/leadershipconference. NEW! 2019 Undergraduate Student Success Summit: Learn how you can support and engage with undergraduate students, and share your own research, discoveries, innovations and interventions that bolster student success at the 2019 Undergraduate Student Success Summit. Thursday, March 7, 8:30 a.m. to 4 p.m., Memorial Union, Corvallis campus. Register to attend HERE. Phi Beta Kappa Visiting Scholar Lecture: Join us Feb. 7 at 7 p.m. in the MU Horizon Room for the Phi Beta Kappa Visiting Scholar Lecture with Jamsheed Choksy, distinguished professor and chair of Central Eurasian Studies at Indiana University. Choksy's talk will be on "The Spread of Islam: New Ways of Understanding Conquest and Confessional Change in Iraq, Iran and Central Asia." For questions or accommodations for disabilities, contact events@oregonstate.edu or 541-737-6522. Science Pub: Benjamin Dalziel, an assistant professor in Oregon State University’s College of Science, will discuss his research on how the flu virus is transmitted at the Corvallis Science Pub on Monday, Feb. 11. Dalziel and collaborators have examined the patterns people follow in 603 cities regarding where they live and work, along with the role a key weather metric – specific humidity – played in flu epidemics. The presentation will start at 6 p.m. at the Old World Deli, 341 Second St. in Corvallis. It is free and open to the public. Due to the continuing popularity of Science Pub, attendance will be limited and advance registration will be required. Registration is at https://bit.ly/2W9hfRE or by calling University Events at 541-737-4717. People who arrive without a ticket are welcome but will not be admitted to the reserved seating area until 6 p.m.
Information and Global Social Justice – Italy | Faculty-led Program Info Session: Join librarians Kelly McElroy and Diana Park for a three-credit, two-week program in Ferrara, Italy, from June 26 through July 10. This program is designed for first-time travelers who wish to develop a deeper understanding of social justice issues in a global context by examining information flow within countries and across borders. Please join the info session on Feb. 7 from noon to 1 p.m. in the 2nd Floor West Classroom at the Valley Library. Application deadline: March 15. For more info contact Kelly.mcelroy@oregonstate.edu or faculty.led@oregonstate.edu. Undocu-Ally Training: The Undocumented Task Force at Oregon State University will hold an Undocu-Ally Training for OSU staff and faculty who are interested in learning about how to be an ally of DACA students, students from mixed-status families, and undocumented students at OSU. The training will take place on Friday, Feb. 22, from noon to 2 p.m. in Kidder 202. The Undocumented Task Force strives to better support DACA students, students from mixed-status families, and undocumented students at OSU. If you have specific questions you would like addressed in the training, take a few minutes to participate in this survey. Participation in this survey is anonymous and the responses will help the Task Force create the training. To register for the Undocu-Ally Training, or if you have any questions regarding the event, please email Courtney Garcia, courtney.garcia@oregonstate.edu, or Monica Olvera, monica.olvera@oregonstate.edu. NEW! Rummage Sale EESC will host a rummage sale in the fourth-floor foyer of Kerr from Feb. 4 through 8, from 8 a.m. to 5 p.m., to support the annual food drive. Peruse housewares, books, movies, toys, clothing, and more! For questions, contact Noelle.Mills@oregonstate.edu. NEW! Bake Sale: Prices vary depending on the baked good. Feb. 4, 10 a.m. to 3 p.m., Richardson Hall, 2nd Floor Knuckle. For more information, contact Jessica.Fitzmorris@oregonstate.edu. NEW! Book and DVD Sale: Purchase lightly used books, DVDs and board games to support the 2019 OSU Food Drive. Items range $1-5 dollars. The sale will be running all month in the Magruder Hall lobby. For questions, contact Sara.k.smith@oregonstate.edu. NEW! Quilt and Wood Raffle Ticket Sale: Raffle tickets are $1 each or six tickets for $5 and can be purchased at the Forestry HelpDesk in Richardson Hall throughout the month of February. The drawing will be on Feb, 28 at 1 p.m. For more information contact Jessica.Fitzmorris@oregonstate.edu. NEW! Bingo! Bingo! Bingo! Get your bingo fix and help the local food bank. Business Affairs is hosting a virtual bingo game. Stop by Kerr B100 to get your bingo card; $1 each or six for $5. Cards will be sold through Feb. 15 with bingo numbers announced each weekday starting Feb. 18 on the BAFF Food Drive page. Winner receives 50 percent of the proceeds; the other 50 percent will be donated to the Food Drive. NEW! Bulb Sale: Are you ready for spring? Get your bulbs now. You can order directly from Dutch Mills Bulbs by visiting the Business Affairs fundraising page or stop by Kerr B100 to place your order. Each kit is $10 and will arrive in time for your spring planting. Orders must be received by Feb. 27. Construction commencing in library, and there will be noise during winter and spring terms: Remodeling will be underway through May on the third and fourth floors of the Valley Library during the remodeling of library offices, and there will be construction noise, especially early and mid-morning. For those seeking a quiet area in the library, the fifth-floor Rotunda is designated as a quiet area and the entire sixth floor is for silent study. NEW! New Major: Bachelor of Science in Public Policy: Are you an undergraduate looking to create meaningful change through public policy and law? The new Bachelor of Science in Public Policy teaches you how to effectively identify, investigate and propose policy solutions for the complex issues challenging communities today. Applications for the major are currently being accepted, so explore our website, meet with our advisor, and apply early. NEW! Instructor-Engineering: OSU-Cascades in Bend, Oregon invites applications for a full-time (1.0 FTE), 9-month, fixed-term Instructor of Engineering position. Posting #P02706UF. Full consideration Feb. 12. Closes Feb. 19. NEW! This recruitment will be used to fill one full-time Office Specialist 2 position for the Office of Admissions at Oregon State University. Posting #P01963CT. Closes Feb. 15. NEW! Manager of Operations: OSU Hatfield Marine Science Center in Newport invites applications for a full-time (1.0 FTE), 12-month, Manager of Operations. Posting #P02725UF. Closes Feb. 18. NEW! The Department of Public Safety is accepting applications for a Patrol Sergeant. This is a full-time (1.0 FTE), 12-month, fixed-term professional faculty position. Posting #P02724UF. Closes Feb. 19. NEW! Assistant Professor-Computer Science: The School of Electrical Engineering and Computer Science at Oregon State University invites applications for a full-time (1.0 FTE), 9-month, tenure-track assistant professor position in computer science at OSU-Cascades. Posting #P02735UF. Closes March 1. "Writing is like traveling. It's wonderful to go somewhere, but you get tired of staying. " ~ Langston Hughes, born today in 1902. Corvallis: Rain today, high of 50, low of 40. Chance of showers through the weekend. Central Oregon: Rain today, high of 46, low of 34. Rain likely Saturday, chance of snow showers Sunday. Newport: Rain today, high of 52, low of 41. Chance of showers through the weekend.